George Shinn was drawn to the plateau from his home state of Texas over twenty years ago, after graduating from college with a degree in Fine Arts. George took a job at Fall Creek Falls State Park in 1996, teaching arts and crafts as a seasonal park ranger. This position led to a full time position as the Park Naturalist, operating the park's Environmental Education Center. George then took the opportunity to become a Park Ranger, and was assigned to the Bicentennial Mall State Park in Nashville. 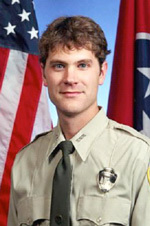 He worked there for one year before becoming the Park Ranger at Savage Gulf State Natural Area. “Everything I dreamed a park ranger does, is there at Savage”, says George of his time at Savage Gulf. “Once I arrived, I never wanted to leave”. In 2013, the South Cumberland State Park manager went out indefinitely on sick leave. The park needed a leader, and George stepped up to become its Interim Park Manager. In October of 2016, George was promoted to Park Manager. In this position, George is determined to make this a great park with the best staff. He is excited about the direction the park is taking and has established a goal of making South Cumberland the "crown jewel" of the Tennessee State Park System. 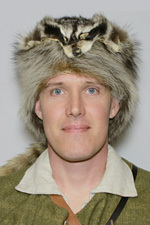 George's hero is Davy Crockett, who he re-enacts, in full costume, at many South Cumberland State Park events. George's wife, Jessica, is from Van Buren County, TN and the couple has made their home in Tennessee since they met in 1993. They are the mostly proud parents of their two teenagers, Katherine and William. Bill Knapp rejoined the team at South Cumberland State Park in the fall of 2016, coming from the Davy Crockett Birthplace State Park. Prior to his tenure at Davy Crockett, Bill worked at SCSP under then-park manager John Christof. Bill, like George, enjoys historic re-enactment and interpretation. 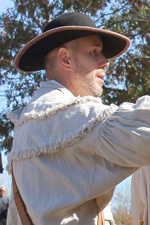 He regularly delights park visitors and school groups with his re-enactment as "Flint Knapp," a typical Tennessee pioneer, proficient in the ways of the black powder rifle and bow drill fire-starting. Bill, his wife and children now make their home near Altamont, Tennessee. Bill Knapp named Tennessee State Park Ranger of the Year! Congratulations to South Cumberland State Park Assistant Park Manager Bill Knapp for being named Tennessee State Parks' Ranger of the Year for his exemplary service, professionalism and strong leadership. Bill is first-class in everything he does and is an outstanding example of a Tennessee State Park Ranger. The Friends are proud to congratulate Ranger Knapp on this well-deserved honor! Mark grew up in the Hilham community of Overton County, about 10 minutes away from Standing Stone State Park. As a kid, he alternated his time between reading and tramping around the woods and fields, often with his grandfather, who first introduced him to the joys of spending time with nature. 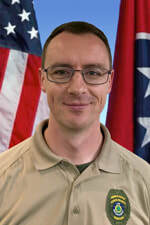 Mark graduated from Tennessee Technological University with a Bachelor of Science in History and spent six years in the infantry of the Marine Corps Reserves, including a tour of duty in Iraq in 2004. His hobbies are reading, writing, watching Sci-Fi/Fantasy TV, and just about anything that involves movement and the outdoors (including being a past participant in the annual Tennessee State Parks Running Tour). Mark says he has enjoyed Tennessee’s State Parks for many years thanks to the efforts of others, and is now pleased to have the opportunity to do his part to protect and maintain our park for the benefit of others. Mark and his wife Valerie currently live in Putnam County, where they like to hike, bike, take long road trips, and talk about everything (or nothing). Ryan hails from Livingston, Tennessee. As a youngster, his backyard playground was Standing Stone State Park, specifically, somewhere in the creek, searching for crayfish or looking for snakes. Ryan graduated from Tennessee Technological University with a degree in Recreation and Leisure Studies. He became interested in pursuing a career with Tennessee State Parks, first by volunteering during weekends at Cummins Falls State Park. 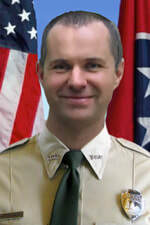 He later became a seasonal Ranger at Henry Horton State Park, and from there moved to the Tennessee State Parks' Central Office in Nashville. However, Ryan was eager to work in a park with abundant hiking, backpacking, and the recreation activities, and he had his heart set on South Cumberland State Park. After first applying for a seasonal (summer) job, Ryan was beyond excited to land a Tennessee State Park Ranger position in our amazing park! Ryan enjoys many forms of outdoor recreation, from backpacking and camping to snowboarding and mountain biking. ​James Holland is a native of South Pittsburg, Tennessee and has a deep love for mountains and wilderness areas. He and his wife, Abbey, are blessed with three sons who also love the outdoors. James has a Bachelor of Science degree from U.T.C. and is a veteran of the Persian Gulf War. He has a background in natural resources policing and has completed E.M.T. training. James' interests include studying edible and medicinal plants, practicing bushcraft and primitive living skills. Jessie is a Texas Native, but has lived in Tennessee since 1999. She attended the University of Tennessee at Martin where she was President of the Student Activities Council and a sorority girl (yes, you read that right, a Sorority Girl Park Ranger!). She recently completed EMT-B school at Landmark Learning in North Carolina. Her Tennessee State Park career began as a seasonal Boat Dock attendant job at Montgomery Bell State Park in 2009, where she also later became a Seasonal Interpretive Ranger. 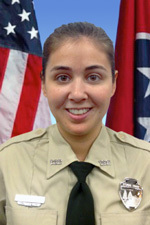 Since then, she has worked at Paris Landing and Reelfoot Lake State Parks, also as a Seasonal Ranger. In 2014, Park Manager George Shinn took a chance and gave this minute sorority girl a chance to show the world what a Lady Ranger could do by hiring her full-time at South Cumberland State Park. Jessie enjoys paddling, reading, hiking, obsessing over super heroes, being social and chasing Pokémon. From an early age Jason would seek out the wild spaces in, behind and sometimes underneath the Nashville neighborhoods where he grew up. Drainage ditches were his river-cut canyons, bridge pilings served as rock climbing spires, manhole covers were the secret entrances to hidden "caves" beneath the city streets, and a black Diamond-Back BMX bike was his trusty steed. With 16 came a driver's license and trips to the real woods and actual rock bluffs commenced at once. Throughout high school and college years Jason would visit the wilds of the Cumberland Plateau whenever possible. Cookeville would be home for nine years and where he would meet his future wife Cari, and graduate from Tennessee Tech. His degree in Horticulture served him well but the wilderness called, so in 2002 State Park Ranger became his chosen profession. 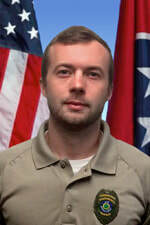 After working at Standing Stone, Tims Ford, and Henry Horton, he joined South Cumberland in 2003. Jason and Cari currently live near Sewanee where they enjoy camping, bridge hunting, movies, truck rides with their dogs, and general exploration of the countryside (and the occasional drainage ditch). Dan was born and raised in Absecon, New Jersey, where he quickly fell in love with everything about the outdoors. He received a Bachelor of Science degree in Environmental Science and Biology in 2011 from King’s College in Wilkes-Barre, Pennsylvania. Dan began his environmental career working as an outdoor educator for Clemson University’s Youth Learning Institute, where he taught children about local ecosystems. He moved to Chattanooga in 2016 to accept a job as a crew member with the Southeast Conservation Corps, building hiking trails and removing invasive species. After two seasons as a crew member, he became a crew supervisor on a camping crew, spending 8 days and nights in the woods, working along side his crew of eight members. Dan than took a seasonal job with the Tennessee Division of Forestry, working with the Hemlock Woolly Adelgid (HWA) Strike Team, where he traveled statewide, treating Eastern Hemlocks for HWA, including at South Cumberland State Park. During his time treating our majestic hemlocks, he quickly fell in love with the park and all it has to offer, and is now excited to be a part of the South Cumberland team. Marla Thompson assists our Park Managers in the park's administrative office. She was born and raised in Statesboro, Georgia. She grew up traveling and camping all across the southeast with her family; as a result, she developed a love for the outdoors, specifically the mountains, at an early age. Marla has a Bachelor’s degree in Geography from Georgia Southern University and Master’s degrees in Geography and Sustainable Tourism from East Carolina University. She’s lived close to the beach for much of her life, so working here, on the plateau, is a welcome change of scenery. In her spare time, Marla enjoys hiking, traveling, and spending time with friends and family. Carla was born and raised in Jasper, Tennessee. After almost a decade in the banking industry, Carla was ready for a change and in July, 2017 joined the team at South Cumberland, staffing the front visitor desk and helping to guide our visitors to where they are going. Carla’s parents were born and raised here, on “the mountain”, and because of this, Carla has a vast knowledge of the Plateau. She grew up hiking and camping at Foster Falls, and spending summers with her cousins, here on “the mountain”. Carla and her husband, Randy, have two boys who also have a great love for the outdoors. Welcome Seasonal Interpretive Ranger Spencer Baxter! Spencer Baxter is back for the 2018 season as one of the park's Seasonal Interpretation Rangers. Currently studying at the University of Tennessee at Chattanooga to earn a B.S. in Geology with a minor in Geography, Spencer is excited about his assignments in the many gorges and overlooks in South Cumberland State Park, which are are a perfect fit his interests. An avid rock climber and backpacker with a deep appreciation for Tennessee State Parks, Spencer loves nothing more than to be out on the trails, exploring the natural beauty around him with anyone he meets. He will be working extensively with our Friends volunteers to continue work on the Denny Falls trail this summer. SCSP Mgr. George Shinn (center left) and Assistant Mgr. Bill Knapp (center right) receiving TDEC's 2016 "Excellence in Resource Management" Award in Nashville. 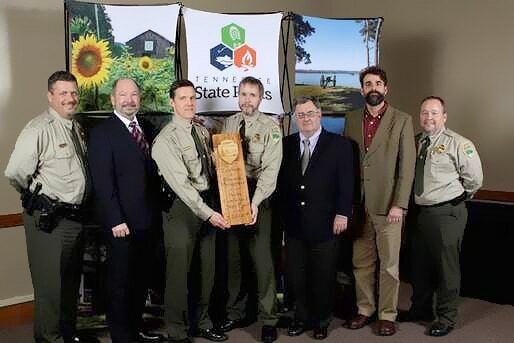 The Tennessee Department of Environment and Conservation (TDEC) recognized South Cumberland State Park for Excellence in Resource Management, for park staff’s work to improve trails, combat invasive pests and provide richer recreation experiences for visitors over the past year. »» Read the full text of the news release.